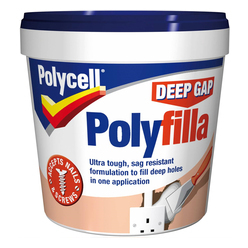 Polycell Deep Gap Polyfilla is the easy way to fill deeper holes, up to 20mm, in one application. Easy to sand for a smooth finish. Fills holes up to 20mm and accepts nails or screws. Fills in one application, without sagging. Easy to sand for a smooth finish. Ensure surface and hole are dry and free from loose material. For holes over 20mm deep, build up in layer to dry in between. Can be over painted with care once surface is dry. After use replace lid, wash tools in warm water.